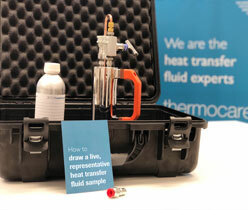 Globaltherm® S is a high performance heat transfer fluid for use in closed loop, non-pressurised heat transfer systems. Primary uses are chemical industries and plastic processing applications. Globaltherm® S is recommended for use in an upper temperature range from 250°C (482°F) to 350°C (662°F), but can be used intermittently at film temperatures as high as 380°C (716° F).